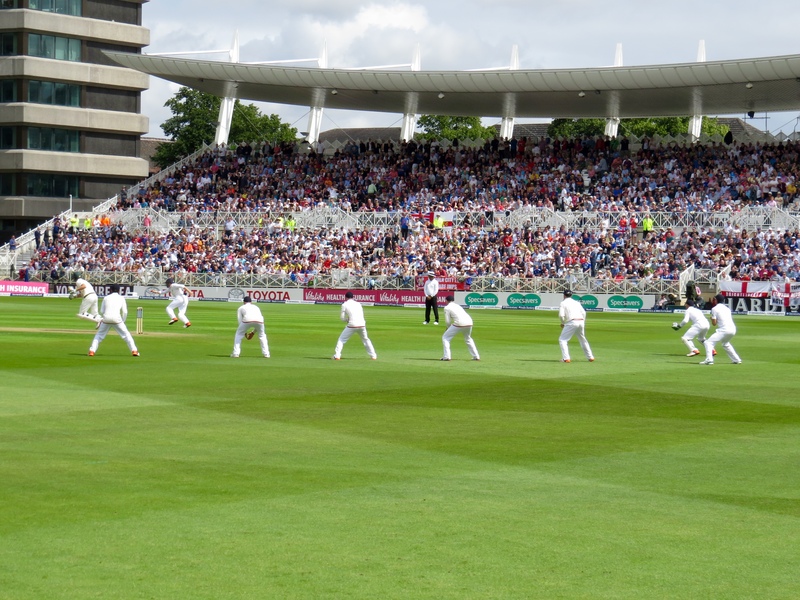 I’m about to break my self made rule about how I write my blog, I have the Surrey v Worcestershire Royal London game to write about – Event 103. 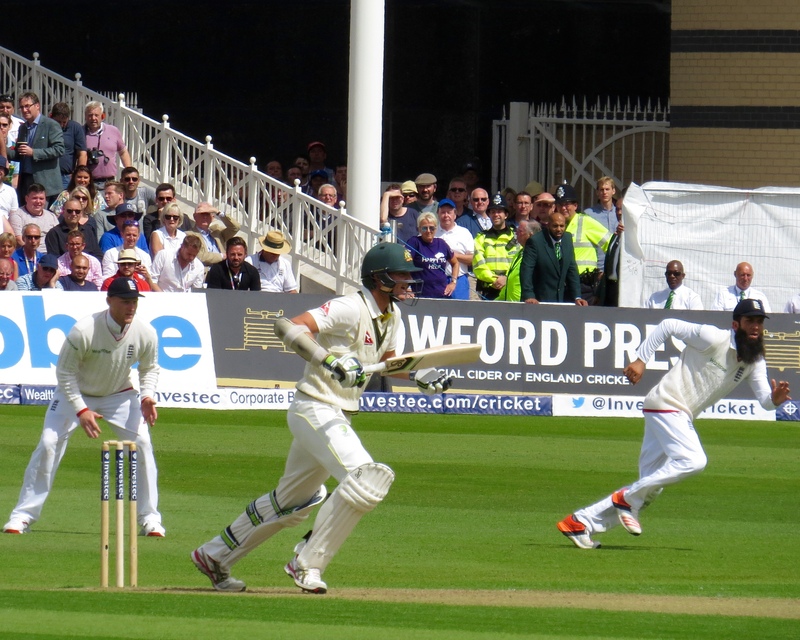 But, I just can’t wait to write about Day 1 of The Ashes at Trent Bridge! 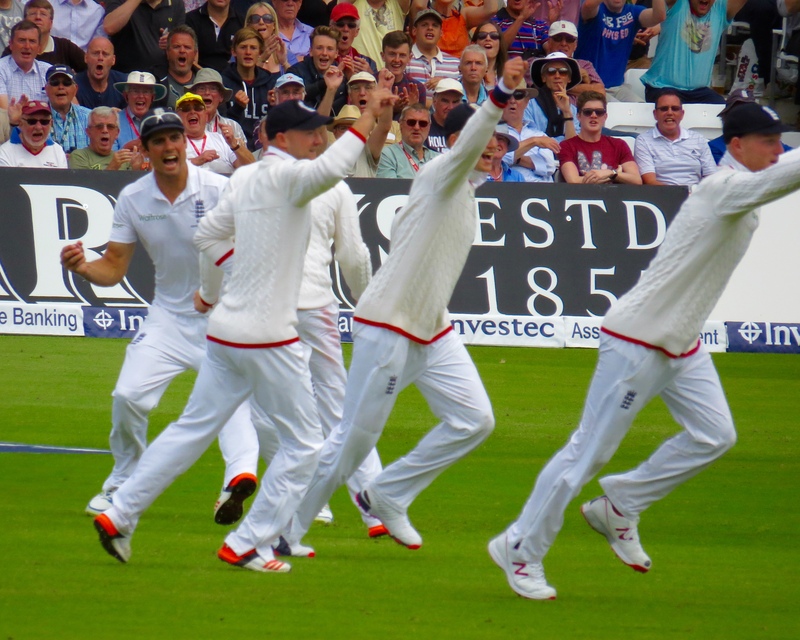 I may not be able to get too many photos in yet, but I just have to get the words down about such a remarkable day in the history of English cricket. Where do I start? 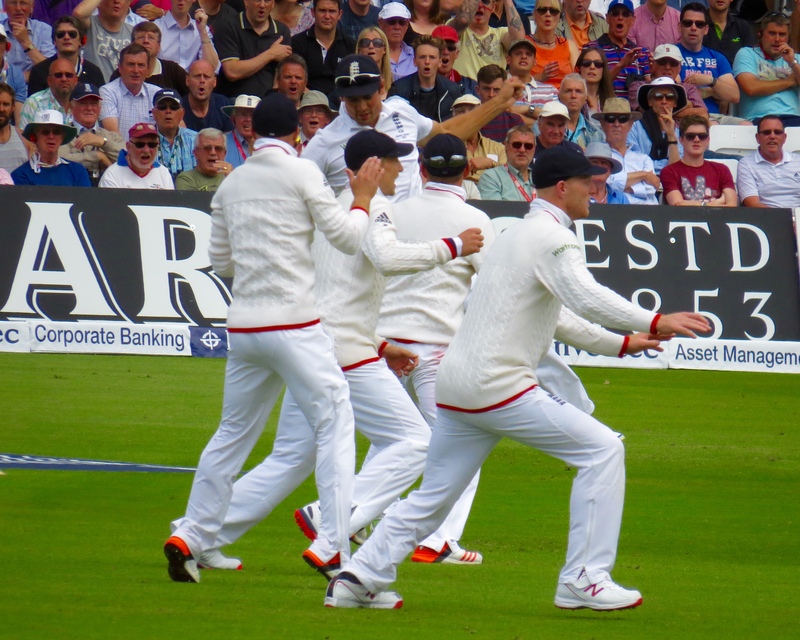 How about – I was there on the day Stuart Broad took 8 wickets for 15 runs, demolishing Australia for the grand total of 60, yes, that’s Six OH, with a little help from Steven Finn, Mark Wood and the slips cordon. 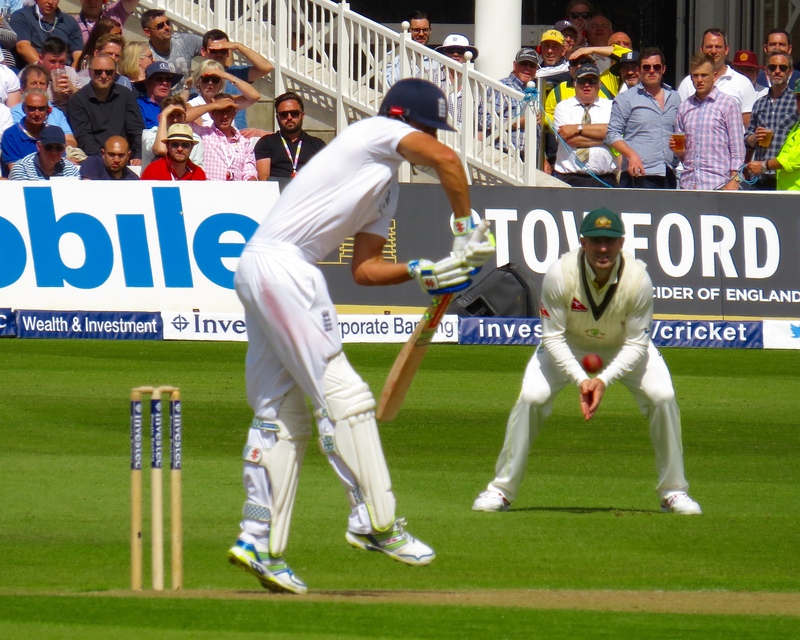 I was there on the day that Jonny Bairstow reminded the cricket world of why he’s been picked and Joe Root further cemented his growing reputation as one of the best batsman in the world hitting more than double the Australian score for a wonderful 124 not out! 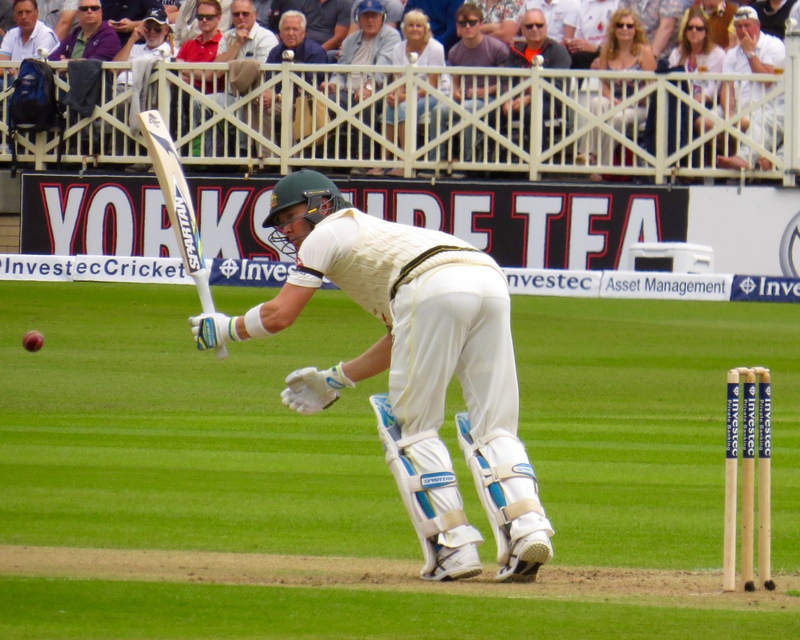 That sums the day up in a nutshell really, but I have to add more detail to what for me and I’m sure many others, was a stand out day not only in this Ashes series, but in my sporting viewing overall, and I have seen some great sporting action this year alone. 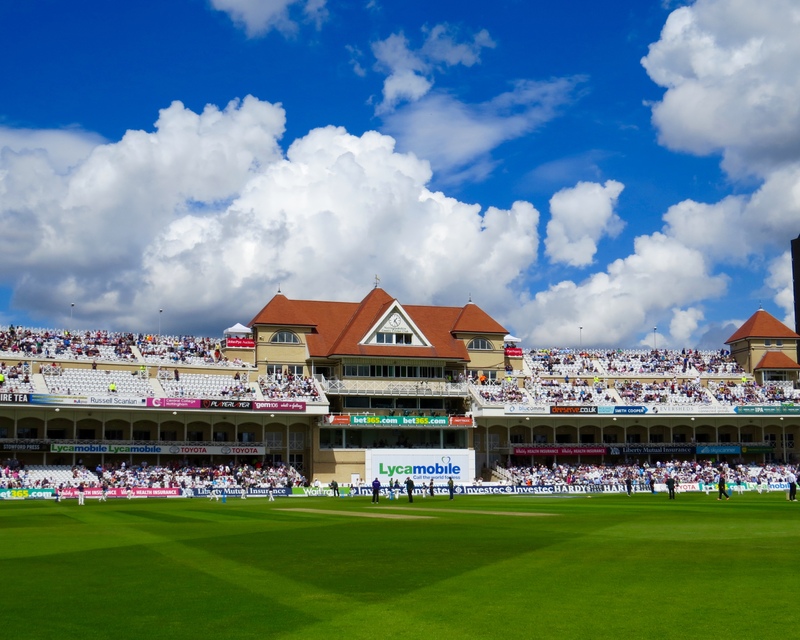 I’d never been to Trent Bridge, but had glimpsed it from a distance when I watched rugby at the County Ground a few years ago, I took the Park & Ride route, paying £5 for an easy journey to the ground. 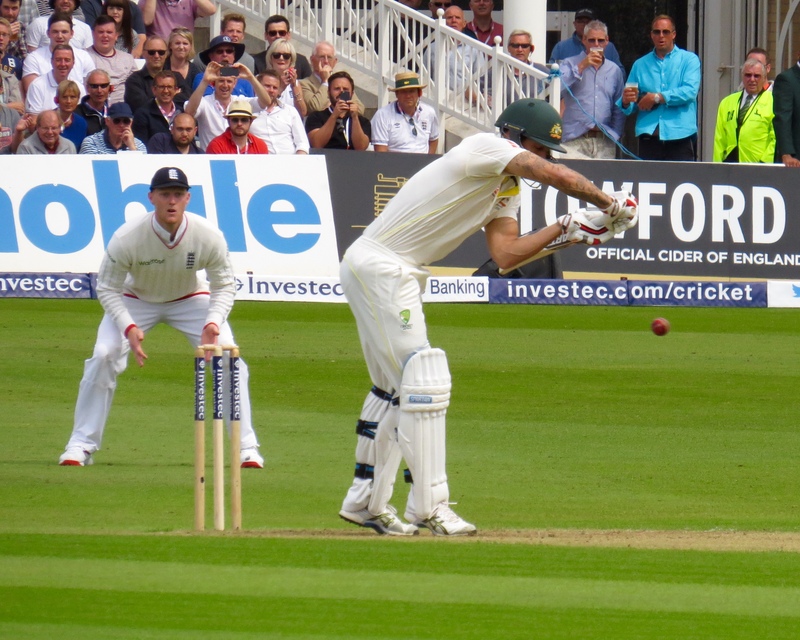 My seat was in the New Stand 4 rows from the front – a really decent view of the debacle that was the Australian innings. 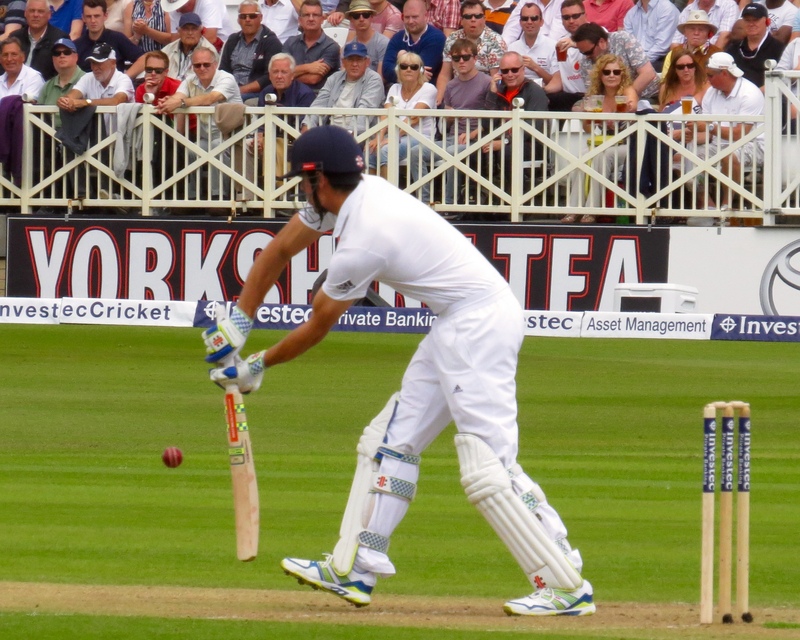 Alastair Cook had won the toss and decided to bowl on what was a fairly green wicket under cloudy skies. 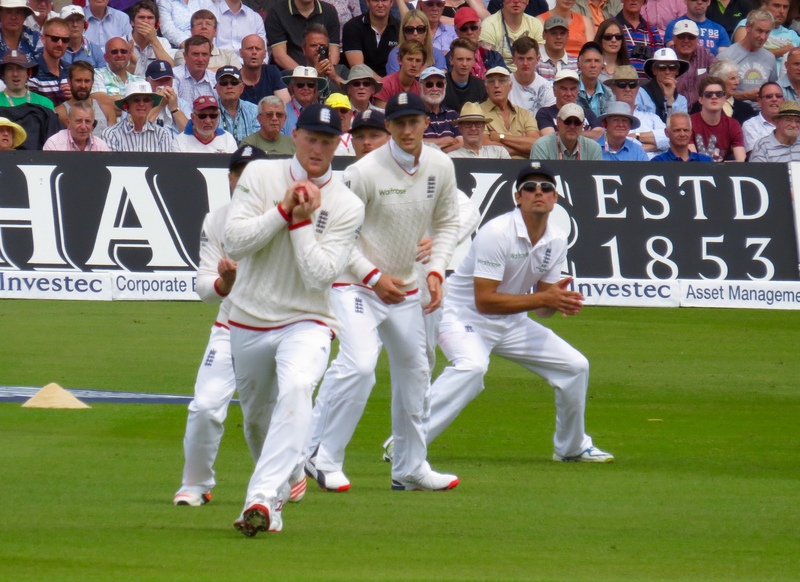 There had been concerns about the absence of Jimmy Anderson, out injured with a nasty side strain, but in the build up to the game he said that it would give Stuart Broad the chance to stand up and shine further. 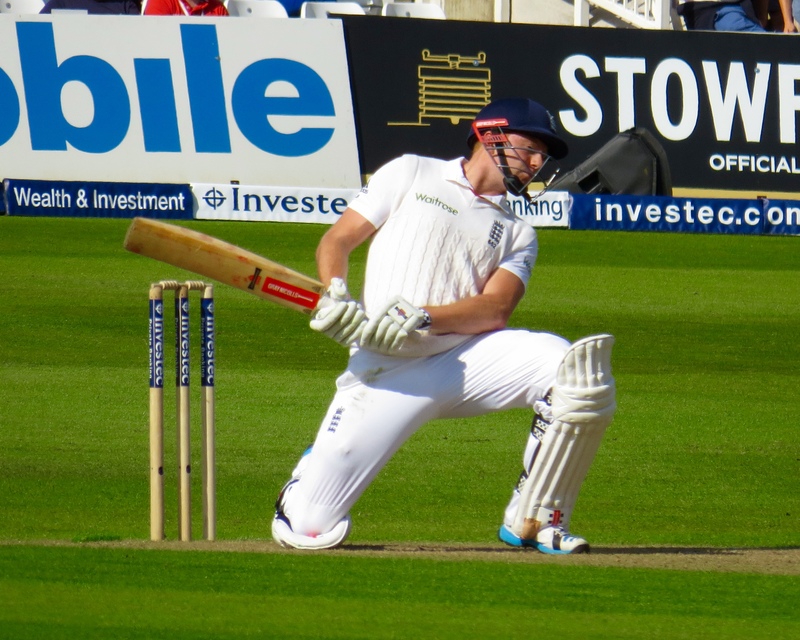 Mark Wood was brought into the bowling attack in Jimmy’s absence, with Steven Finn keeping his spot after his remarkable Edgbaston haul. 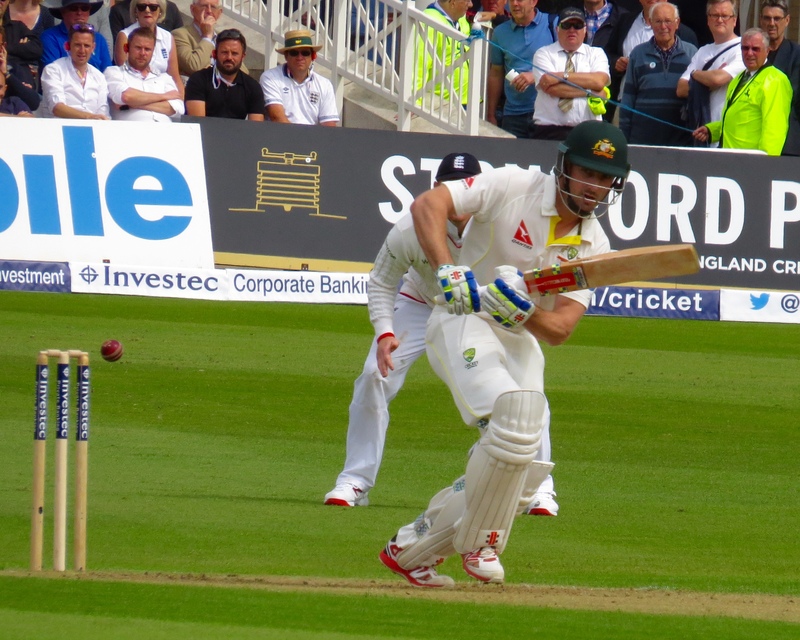 In a bid to shore up their batting lineup Australia had despatched a Mitch in the form of Mitchell Marsh and replaced him with his older brother Shaun Marsh. 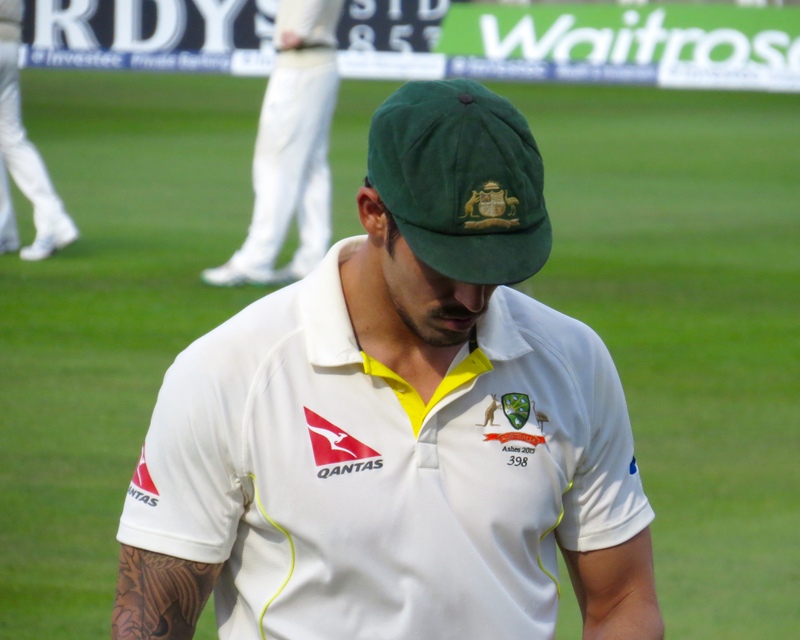 The Australians had been under a lot of pressure, their public don’t hold back when their team underperform. 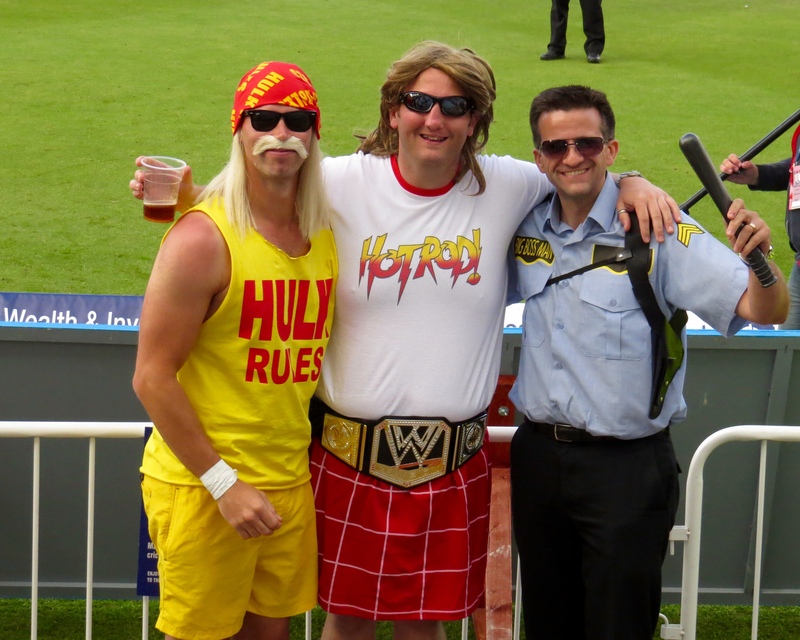 I had the company of Big Boss Man, Tim – Hulk Hogan, Tom – Rowdy Roddy Piper, Brad and their ‘Stag’ friend Luke. They were delightful company all day, and no beer spilt on me! 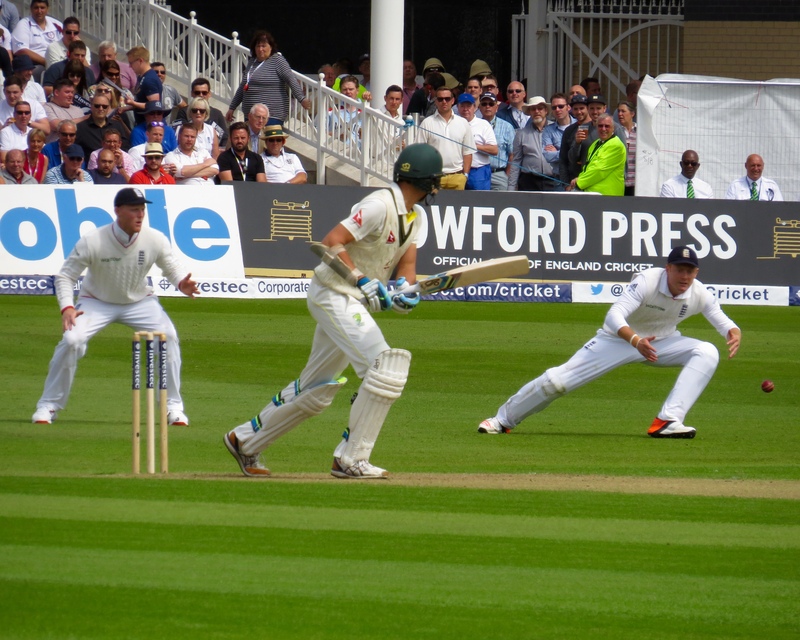 As Broad started the first over I said to Tim ‘can Broad take his 300th wicket in the first over?’ He bowled 2 balls, and saw 4 leg bye’s come from them, then the remarkable stuff started happening! 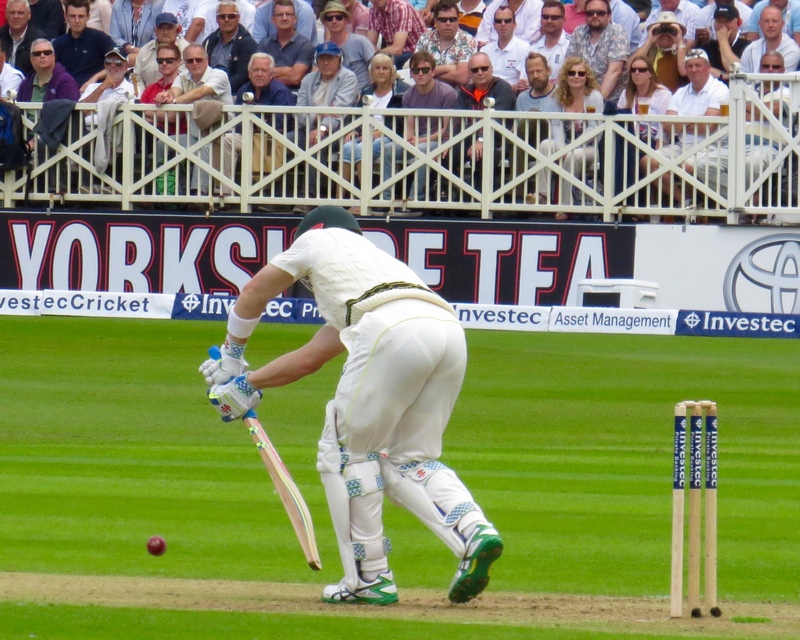 Steve Smith, seemingly the best batsman in the world, was walking to the crease much sooner than he might of hoped. His stay was equally brief! 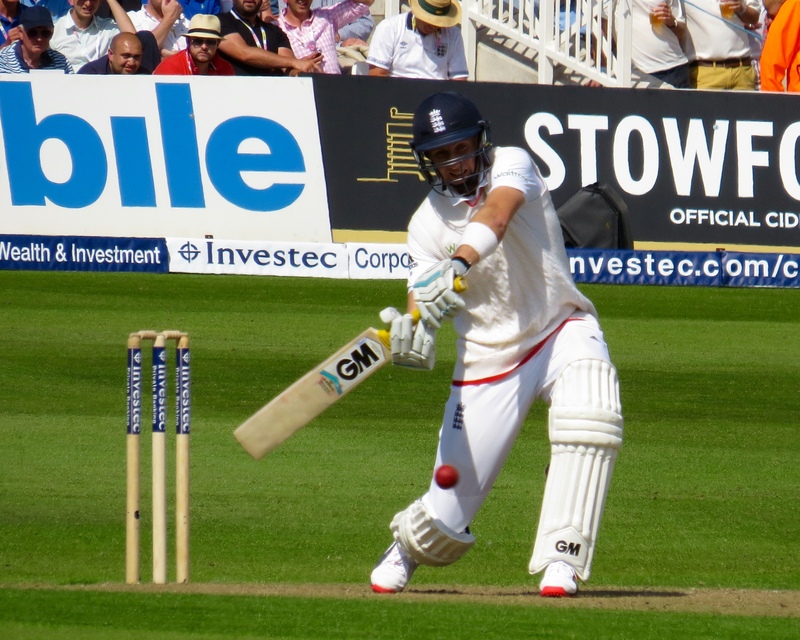 He faced 3 balls and scored 6 runs before he followed Rogers back to the pavilion – caught by Joe Root – wicket 301 for Broad in the 1st over!!! Much jumping and shouting! 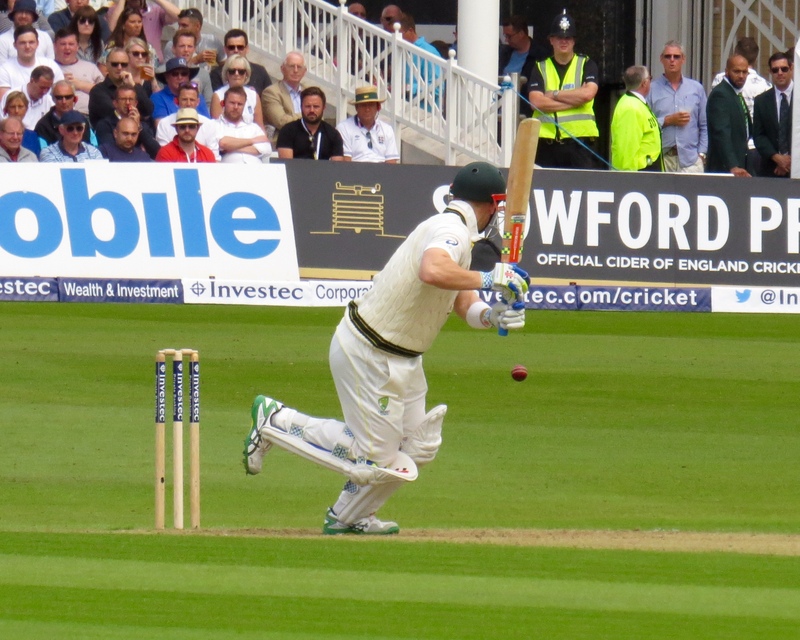 I hadn’t even got my camera out by this point, so missed the odd batsman! 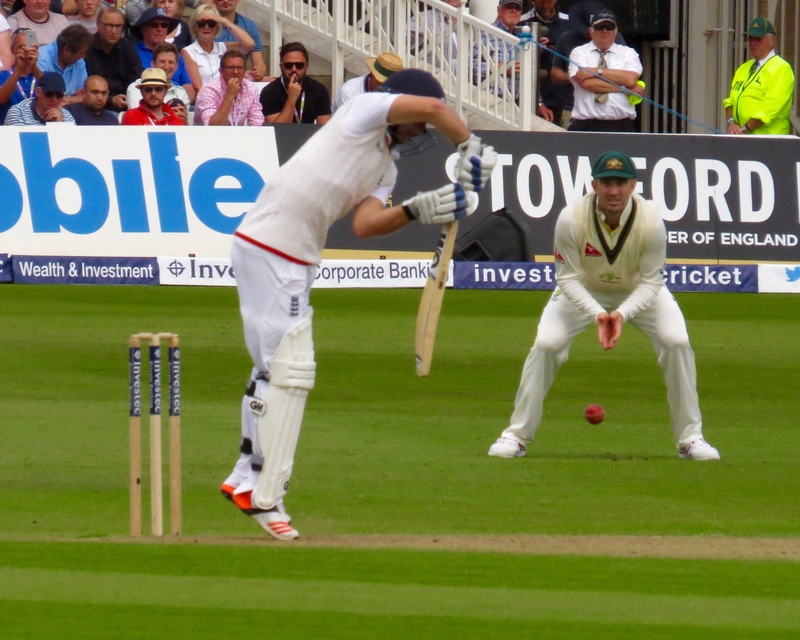 Mark Wood was the next man up with the ball, David Warner was the next man to depart with a duck! 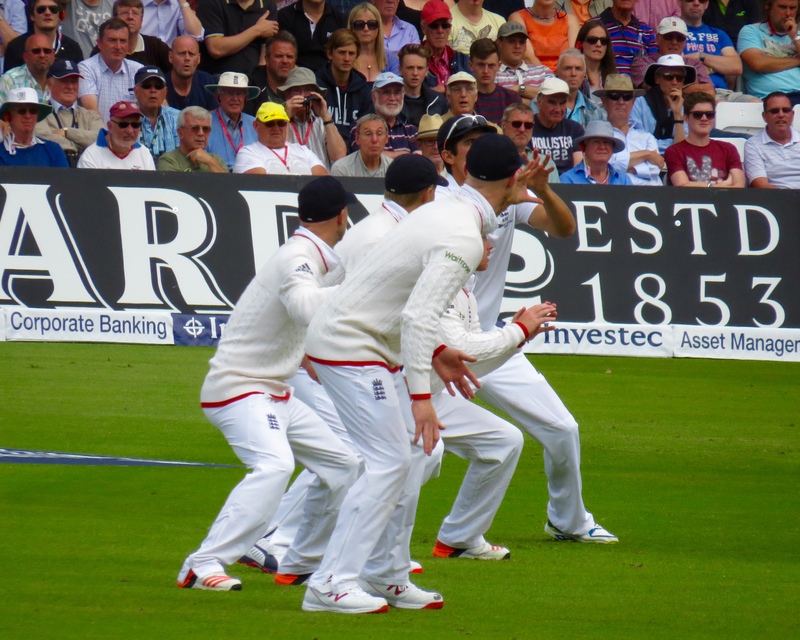 A catch for Jos Buttler – things were being shared around behind the wicket. Australia were on 10 for 3!!!! 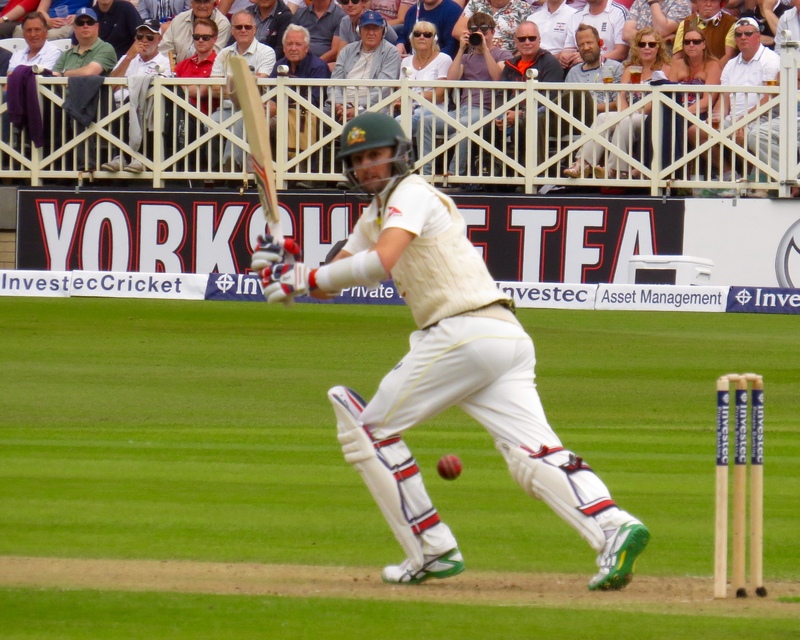 It might be hard to lose track of who was at the crease with all of these quick departures, Shaun Marsh and Michael Clarke, 2 capable men with that piece of willow are men capable of runs. Oh, but not this time! 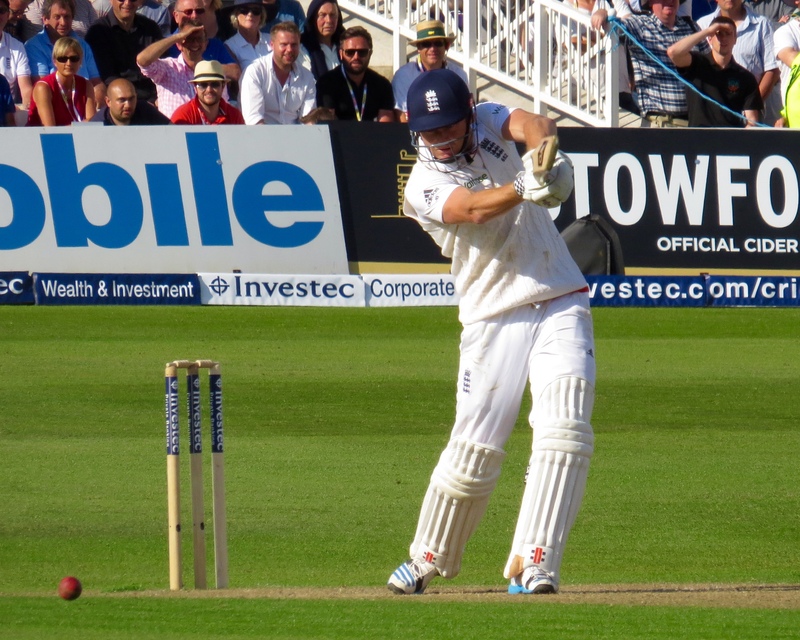 Marsh contributed a big fat duck as he was caught in the slips by Ian Bell – his turn clearly – from the bowling of Broad! This was amazing stuff! It was also Australia on 15 for 4!! 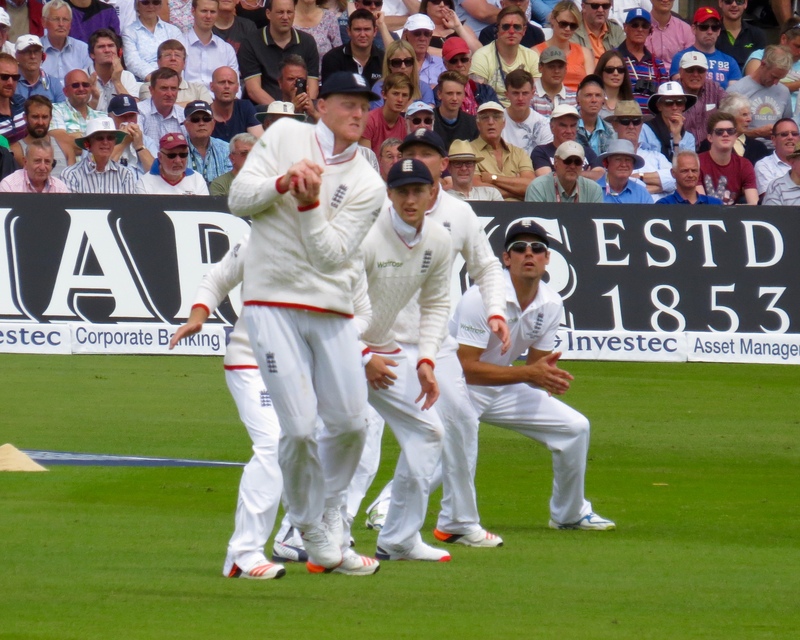 Adam Voges who’s had a miserable tour fared no better – he’s managed a paltry 1 before Ben Stokes took a wonderful catch, seeming to pluck the ball for the air, with one hand. 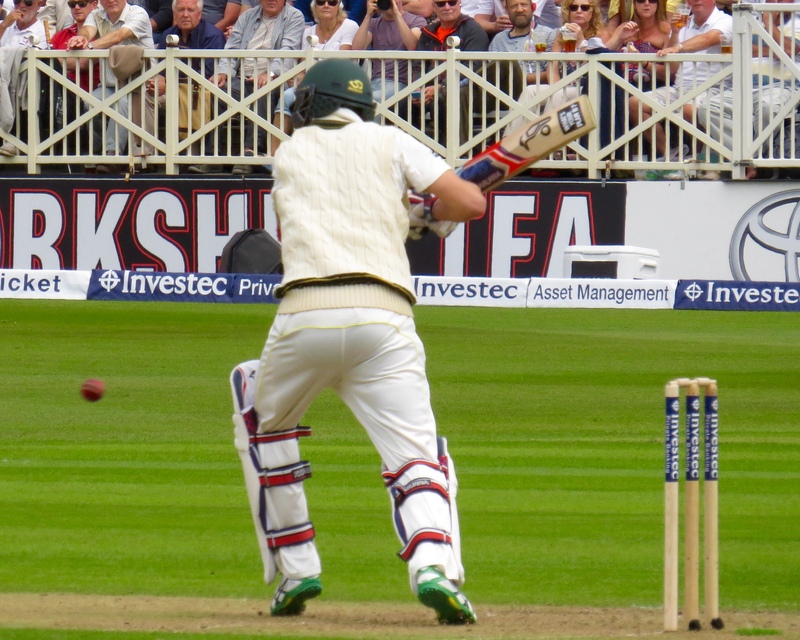 Another wicket for Broad – Australia – 21 for 5!!! 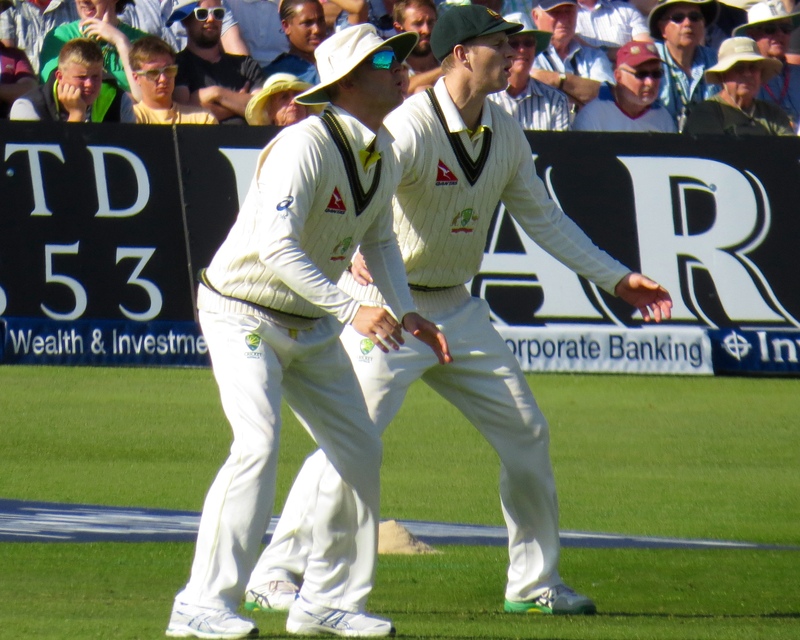 Michael Clarke was the top scorer on 10 when he was despatched by Broad, of course – yet another catch by Captain Cook. Oh, the score? 29 for 6!!!! 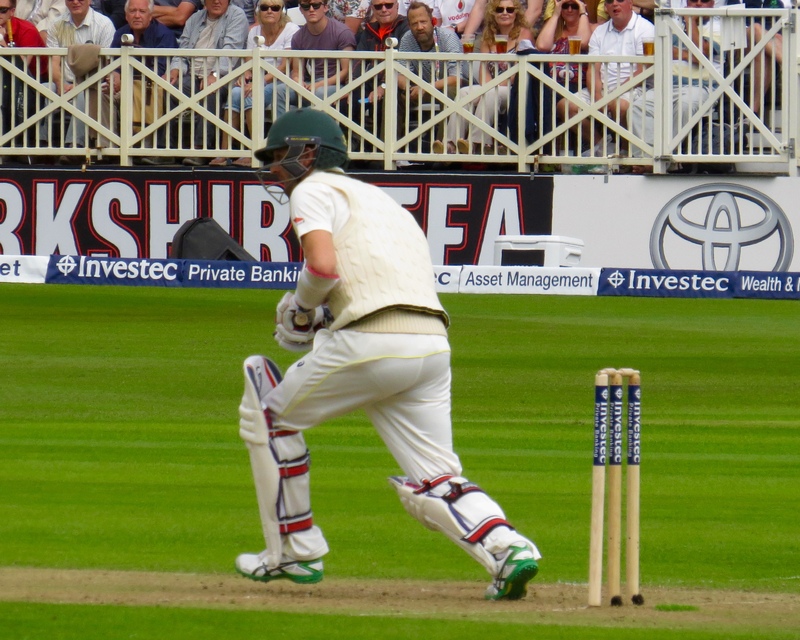 An increasingly unusual thing happened next – Steven Finn clean bowled Peter Nevill – this is becoming something of an obsession for me, of the wickets taken during the Ashes so far (including the end of this day) 116 in all so far, only 21 have seen the stumps flying – I might need to look into that more at the end of the series! The score? 33 for 7!!! 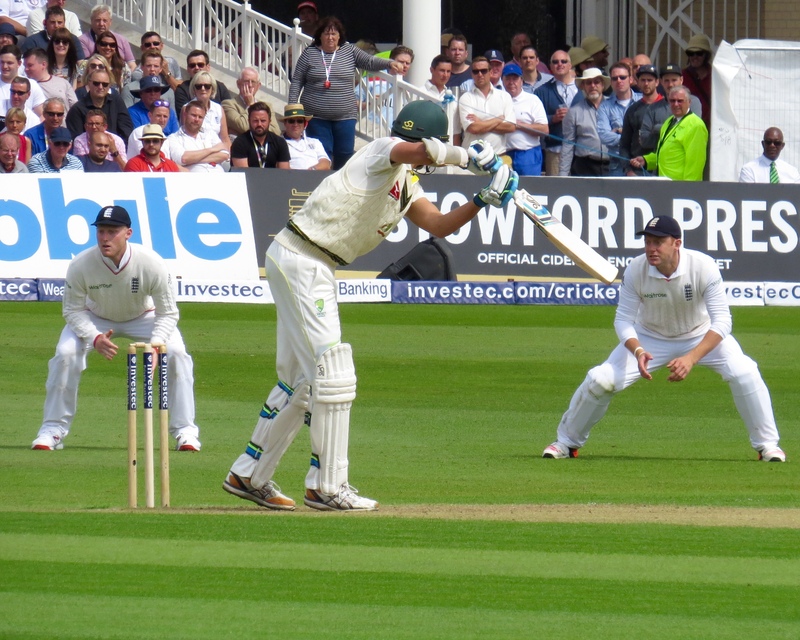 Could this innings be over before lunch? Yes it could! 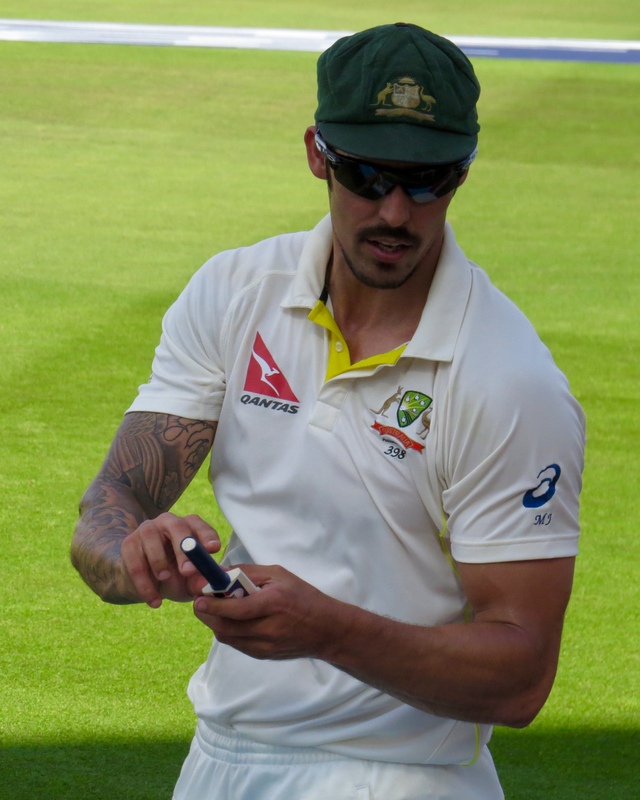 Extras were the top scorer on the Australian scorecard, Mitch Johnson ahead of Clarke’s 10 made 13, no other player made double figures! 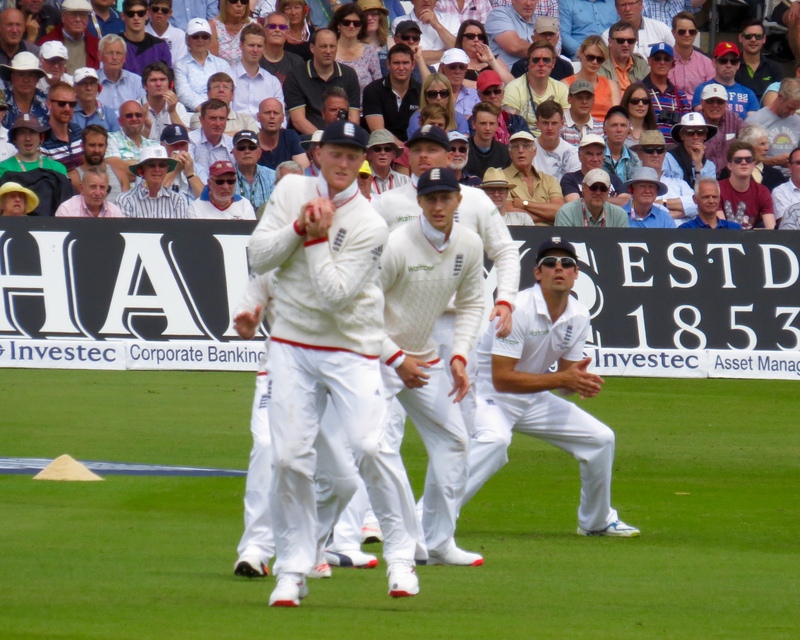 With 2 more catches for Root from the bowling of Broad, and another for Stokes form the bowling of, yes you guessed it – Broad! 8 for 15 – I do need to repeat that! 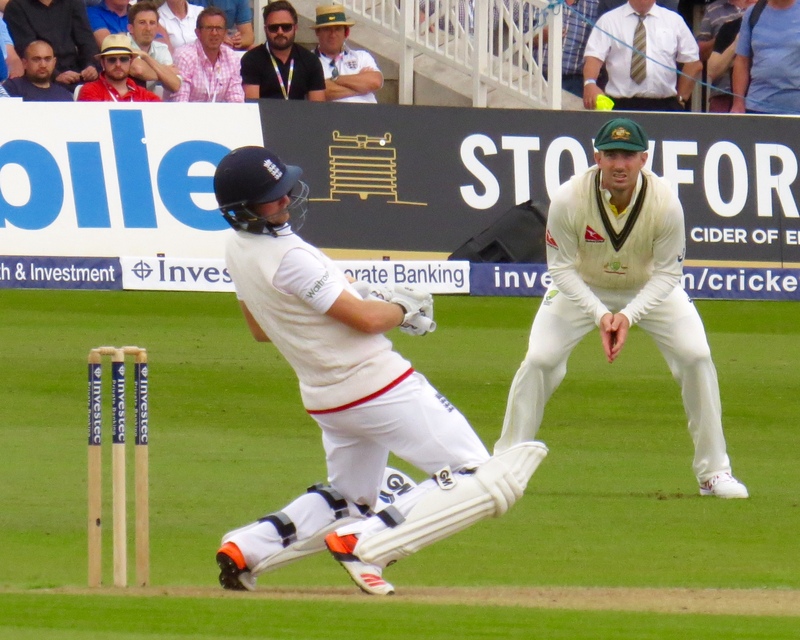 Australia were all out for 60!!!! 60 ALL OUT before lunch!! Incredible! 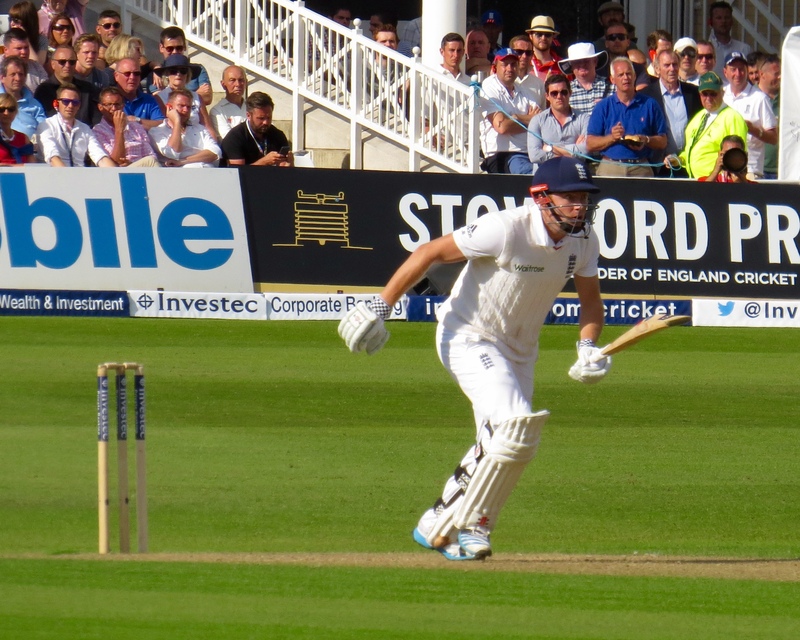 111 balls and the innings was done and dusted! 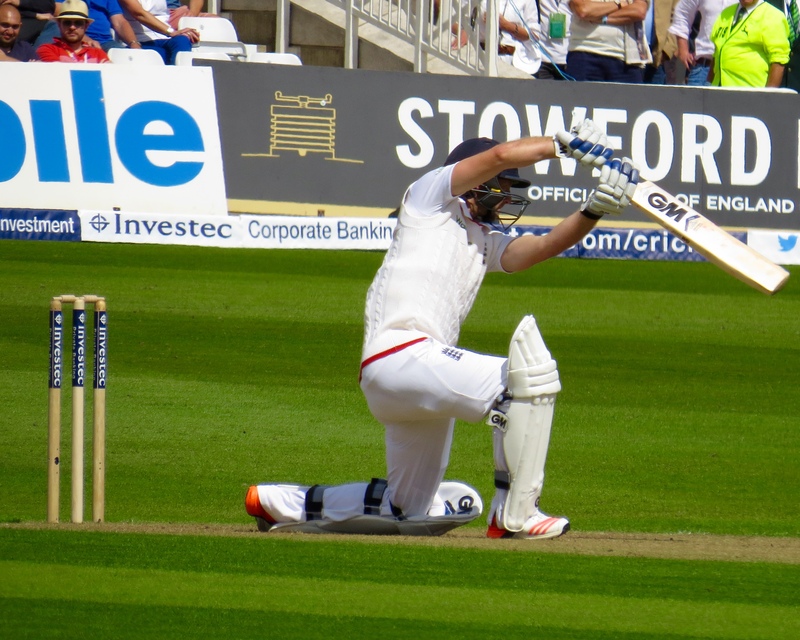 Ian Bell wasn’t to recreate his Edgbaston form, he faced only 6 balls before he was trapped LBW by Starc – England were on 34 for 2 but one Joe Root mad this way to the crease. This young man is having an immense summer, he plays with assurance and a wholly natural skill. 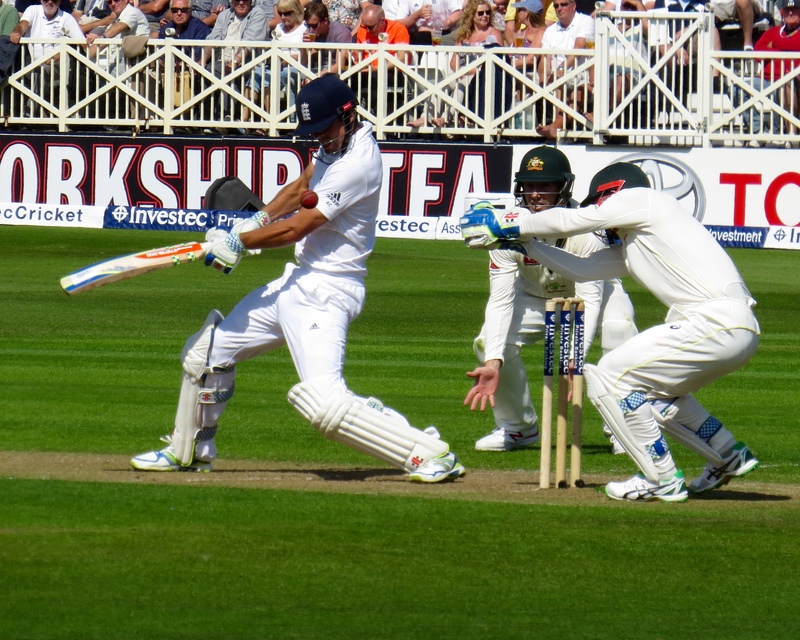 Alastair Cook made a decent 43 before he was out via a blatant LBW, Starc again. 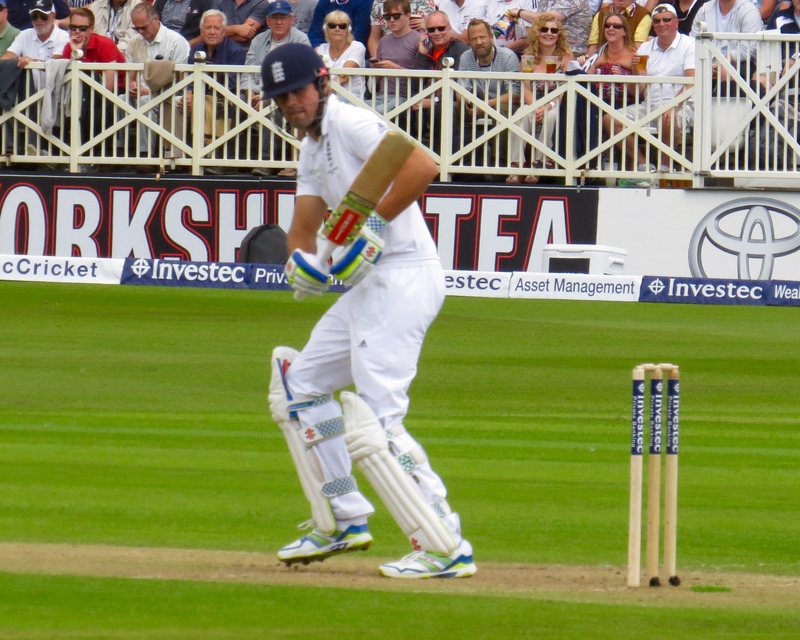 The score had moved on to 96 for 3 – a very useful partnership. 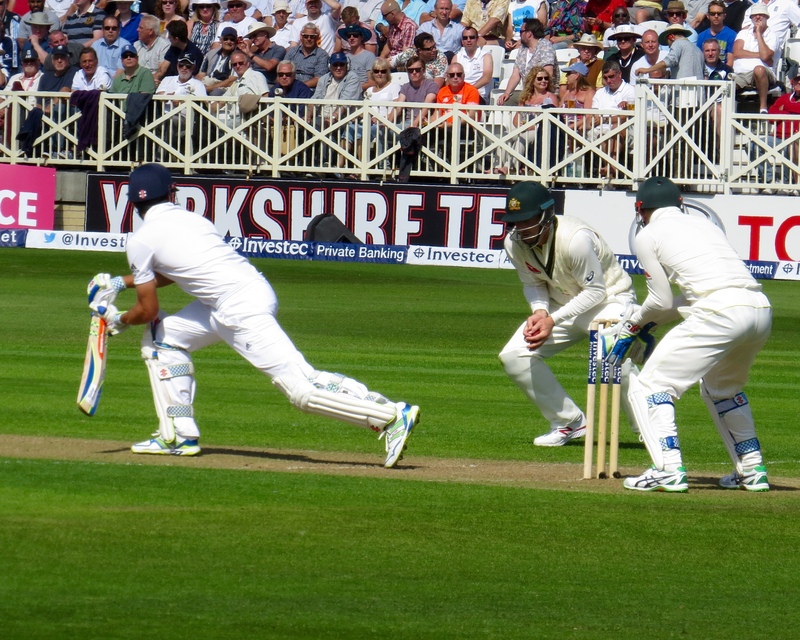 Jonny Bairstow joined his Yorkshire team mate and the 2 put on a batting masterclass. 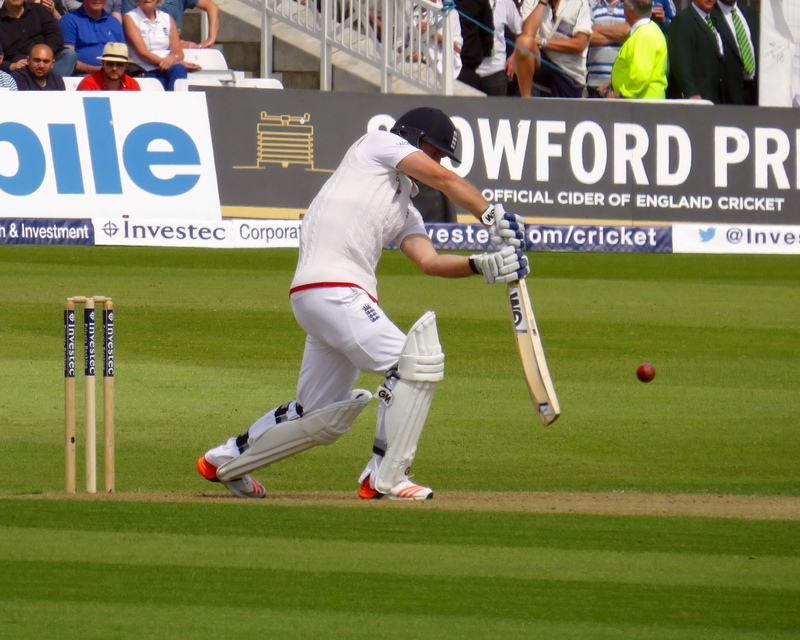 They put on a wonderful 173, and both found the boundary with what looked like effortless shots time after time. 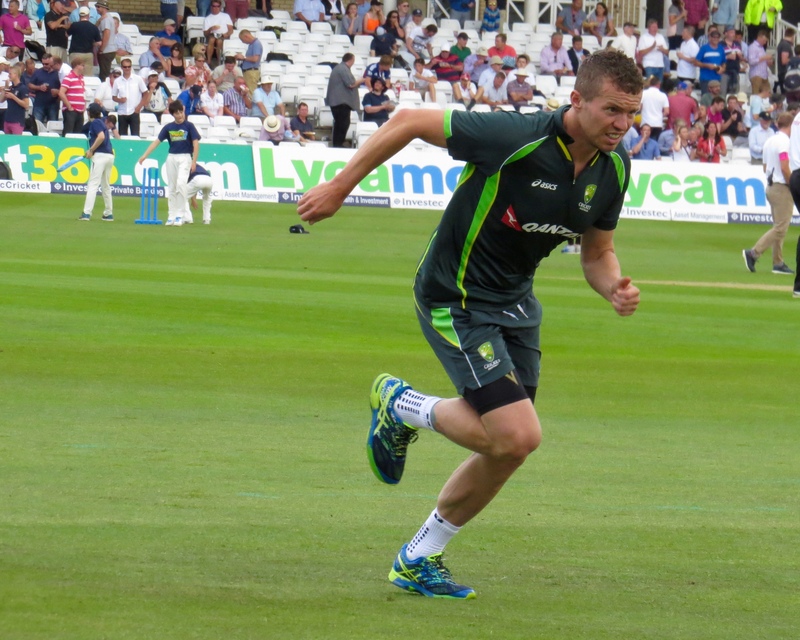 Much to the disappointment of every English ‘man’ in the place David Warner took a great catch form the bowling of Josh Hazlewood to see Bairstow depart having scored 74. 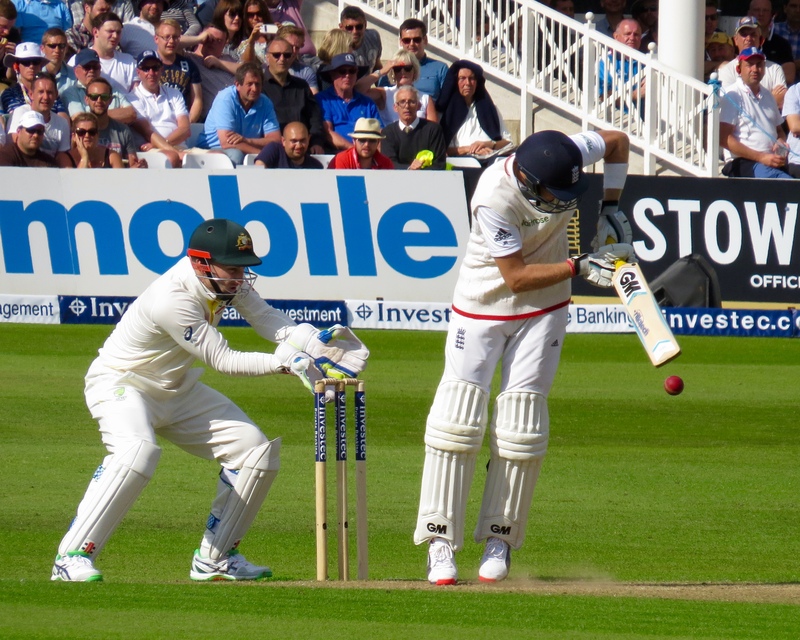 Joe Root grows in stature every time I see him play, by the end of the day he’d scored 124 runs, more than double the Australian total! That included nineteen 4’s and an almighty 6! 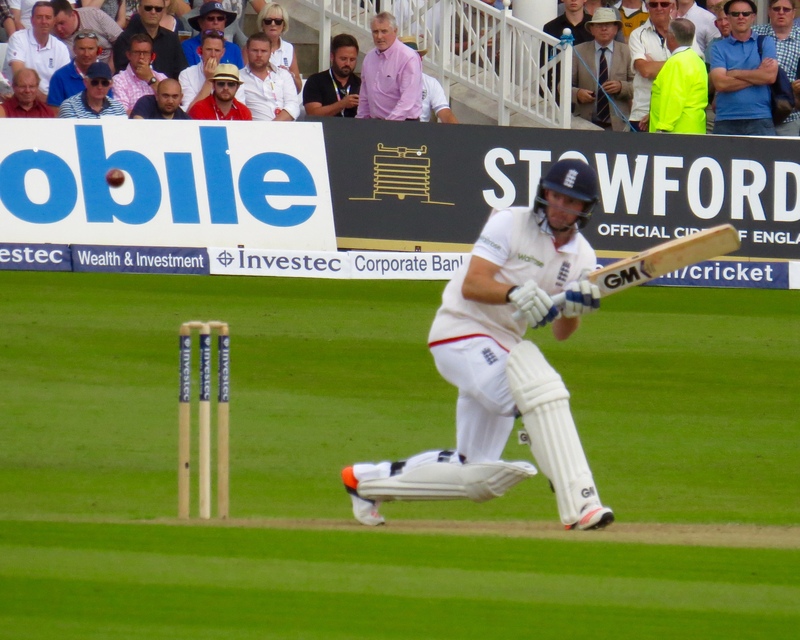 England were on 274 for 4 as 6:35 came, with the overs bowled short by 6 for the day – a lead of 214! I can barely find the words to describe this day so I’m just going to finish with !!!!!!!!!!!!!!!!!!! 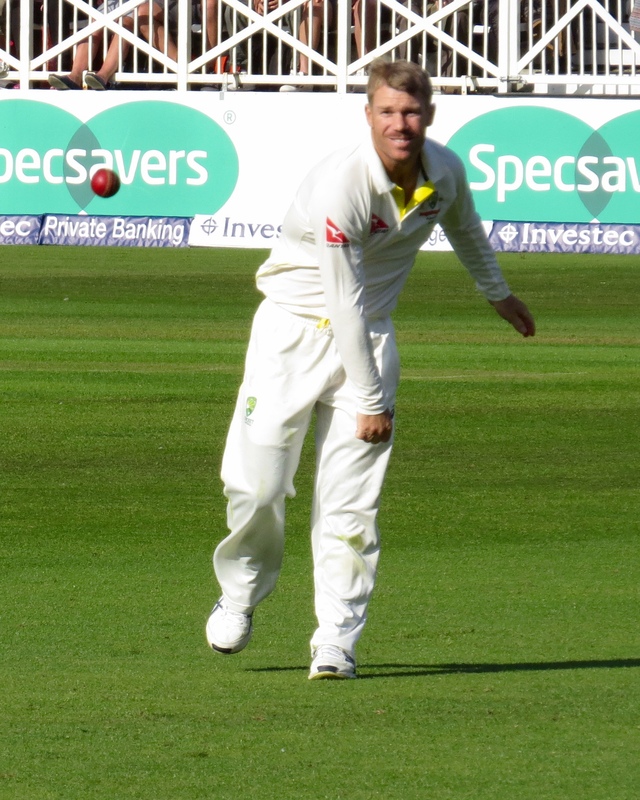 A footnote having added in a few more photos – We saw the strange sight of David Warner bowling, he didn’t do too badly all in all! 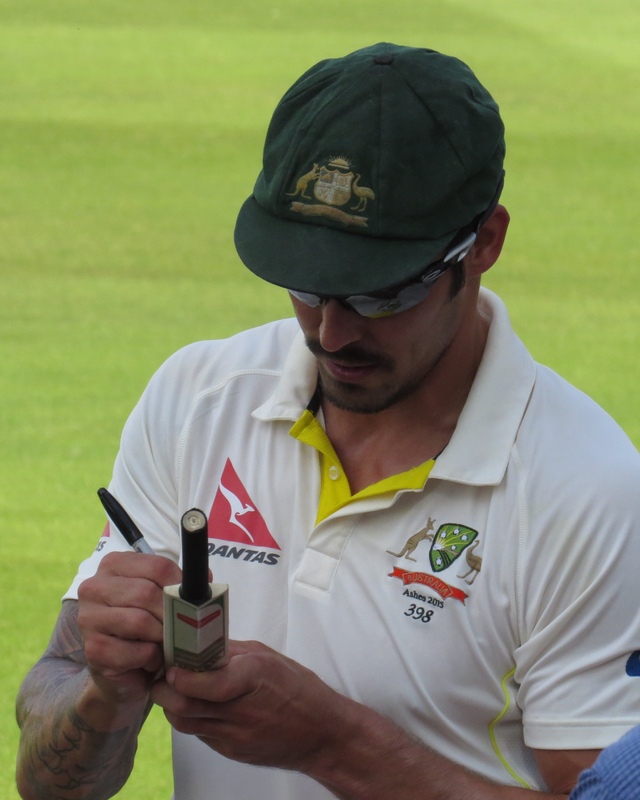 And to say again what a good sport Mitch Johnson was, huge credit to him. Sensational viewing. 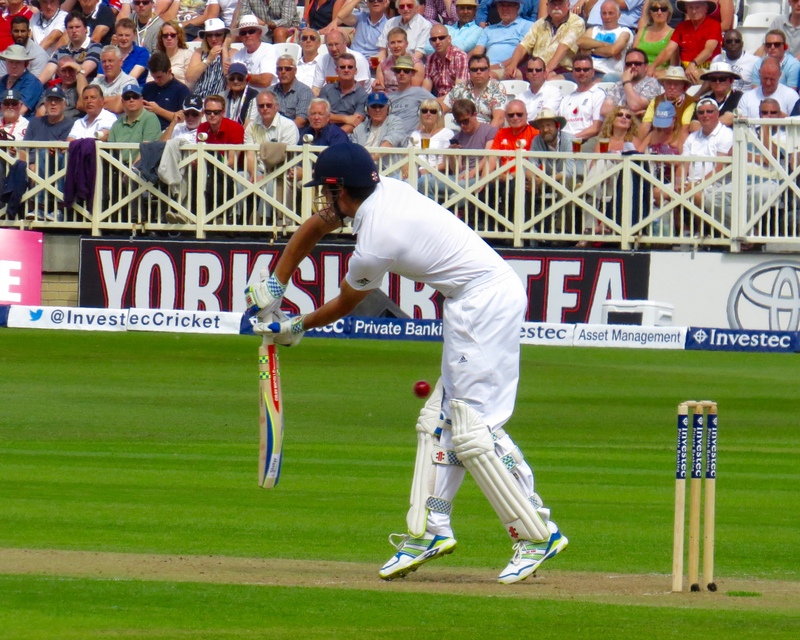 Seeing fast bowlers steaming in causing batsman problems is one of my favourite sights in sport. 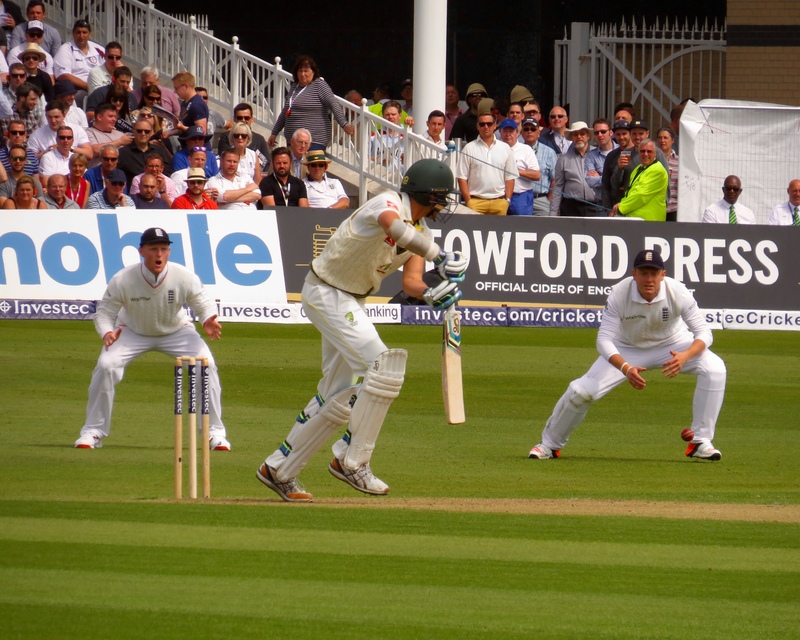 When it’s England skittling Australia in an ashes test its unbeatable. 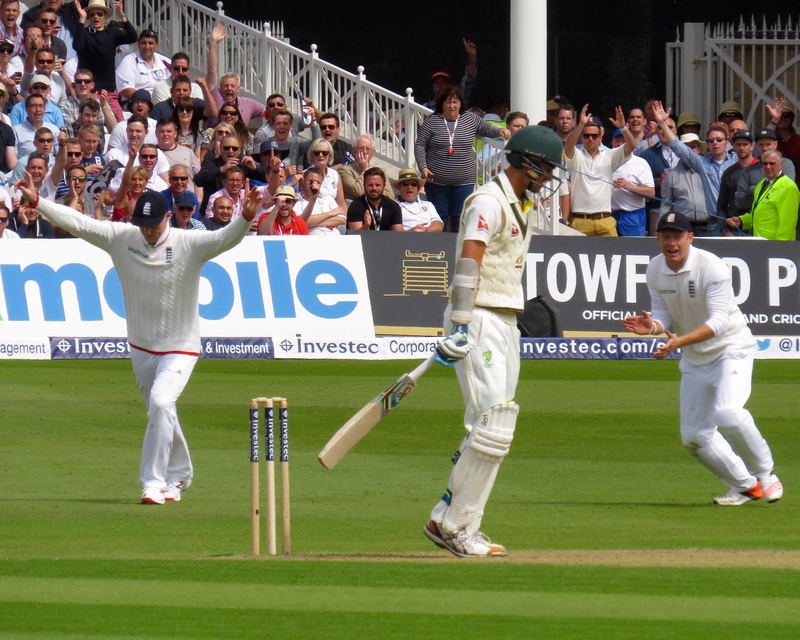 Huge credit goes to Cook, winning the toss and bowling is still unusual. 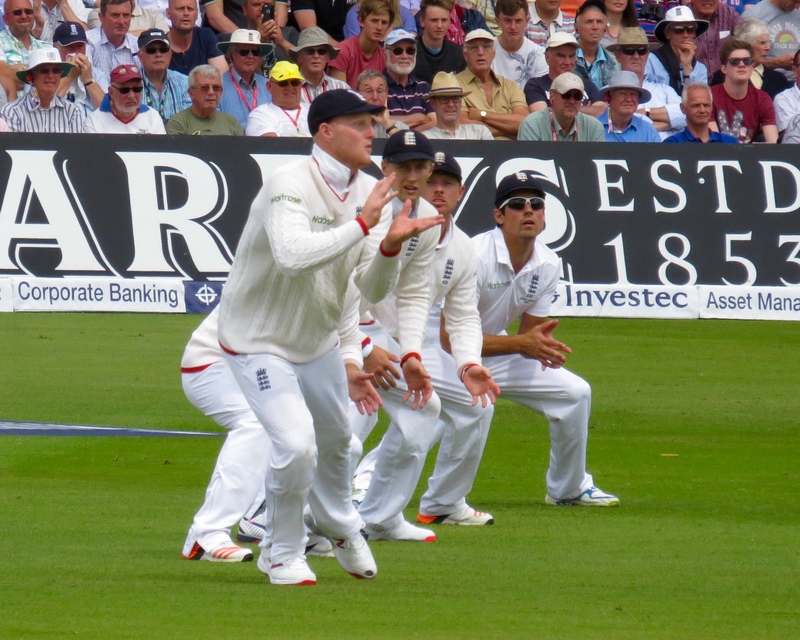 If you’re brave enough to do it, you put a lot of belief in your bowlers. He did it with no Anderson. 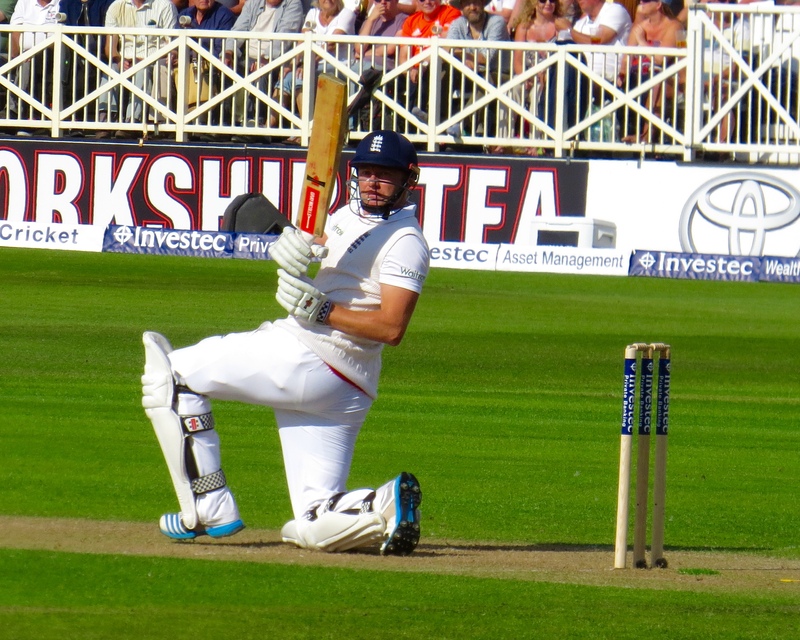 He then trusted Mark Wood to open with Broad when giving the ball to Finn would have been the easy/obvious option, and they sure did deliver! 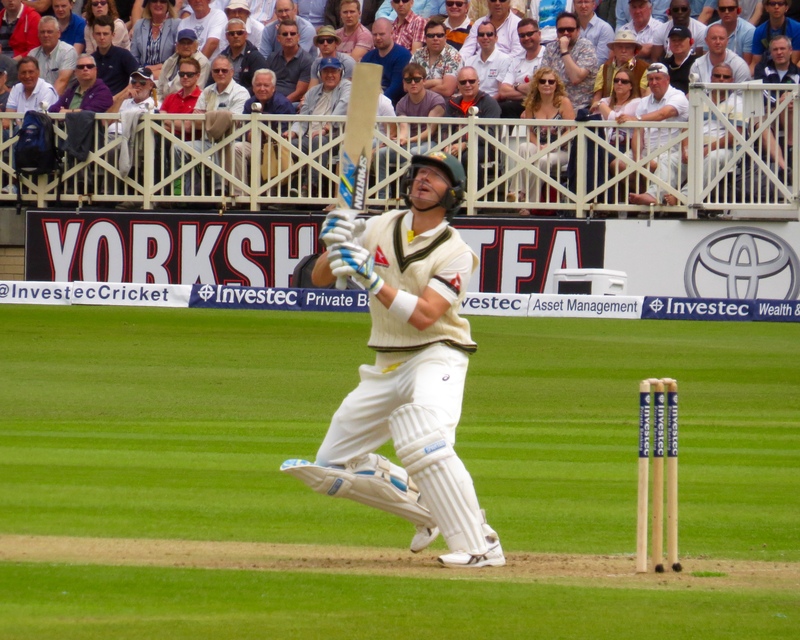 Such consistency in hitting the right spot on the pitch was strangely Glenn McGrath like. 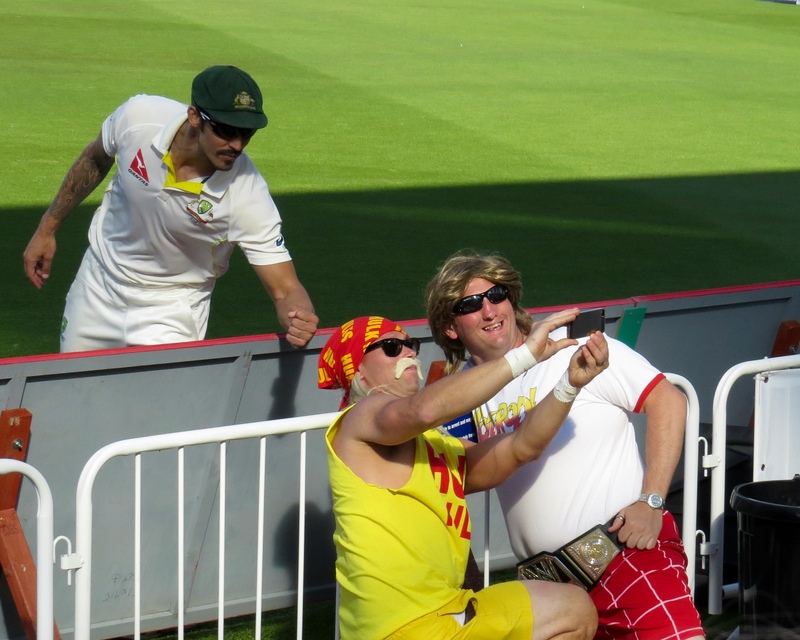 Australia’s bowling was absolute garbage. It really was. Unless it’s a flat, fast track where they can bang in the short ball they have nothing to offer. Come on England.